Apple has been selling photo prints and books through the Photos (previously iPhoto) app for many years. But the company is exiting this business in the fall. I guess you could ask, why was Apple still in the print business at all? Sure, in the early days, it was probably somewhat lucrative, since it was so easy to order prints directly from within the app. But there is so much competition that there’s little point to Apple being involved in this. And Apple certainly didn’t do this printing themselves; they outsourced it to a company whose core business this is. 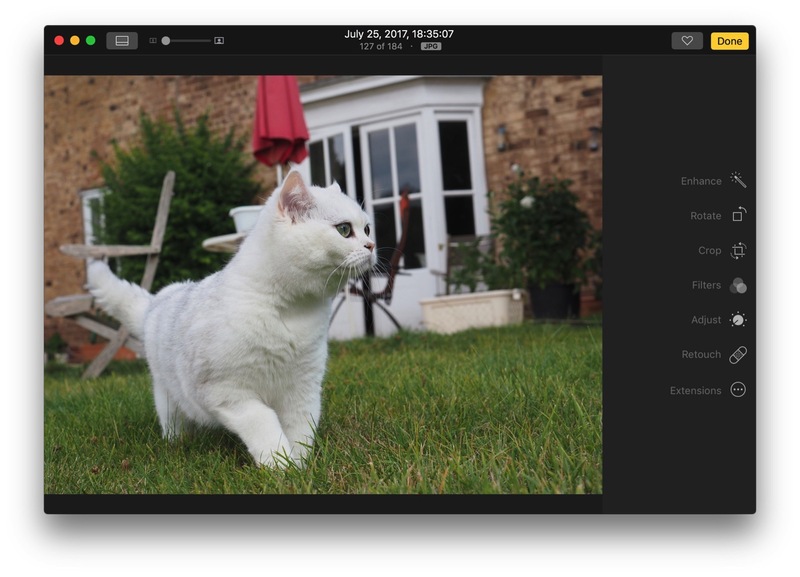 There are a number of Mac apps that can work as extensions to Photos that offer this service, and clicking the left-hand button above takes you to the Mac App Store to check them out. And there are hundreds, even thousands of companies offering prints online. The advantage of using the Photos app, or an extension, is that you can organize projects from within the app, making it very simple. If you install one of these extensions, you can access it from the File > Create menu when viewing a photo album. Apple tends to dumb down many of their features, and this is very obvious in their cloud tools. With iCloud Music Library, for example, you can’t choose to not sync certain albums, playlists, or genres; it’s all or nothing. With iCloud Photo Library, it’s the same: you sync everything, or you sync nothing. It’s problematic with iTunes, but you can always remove the music you don’t want to sync to the cloud. In addition, you don’t pay for cloud storage; iCloud Music Library lets you sync up to 100,000 tracks, more than enough for most people. With my two cameras, the raw files are 20-50 MB each. Because of this, my Photos library which contains about 2,400 photos, takes up nearly 40 GB. This is a problem for two reasons. The first is that I have to pay for iCloud storage, and I’m getting close to the 50 GB that I currently pay for; the next tier is 200 GB, which I won’t be able to fill for some time. The second is the fact that syncing all these files takes a long time. I only have 1 Mbps upload, and if I shoot a lot of photos, it can take hours for them to sync. And the way iCloud Photo Library works means that if I ever have to sign out of iCloud for troubleshooting – something I’ve had to do in recent months – then sign in again, it uploads everything, even though all the photos are in the cloud. And that takes days with my bandwidth. Apple could offer an advanced sync option, whereby you would choose to either sync to the cloud certain albums or exclude them (similar to the way you choose to sync or not sync music to an iPod or iOS device), and allow you to choose to not sync videos, raw files, and perhaps other types of photos. Or perhaps only sync favorites, or other types of selections. Apple has designed iCloud Photo Library for people using iOS devices, who don’t have these issues, but more and more people use Photos to store photos shot with other cameras. The launch of the new Lightroom, which is subscription only, will probably lead a lot more people to look at Photos as a solution for both managing and editing photos. It’s a great tool, but the lack of selective sync hobbles it for many users. To show you how this works, I’m going to use a photo that has a very strong, colorful subject. Here is the photo in the Photos interface in Edit mode. As you can see to the right of the photo, I’ve opened the Selective Color tool by clicking on the disclosure triangle to the left of its name. To adjust a color, click one of the six color buttons, then move the sliders below. Hue is the actual color itself, such as taking a greenish blue and making it bluer, or changing a yellow to look more or less orange. Saturation adjusts the intensity of the color. And range is how much related colors are affected; a higher range affects a wider band of colors. When you edit photos, and want to share them, there are two ways to save files in JPEG format. And these two methods create files of very different quality. It happens all the time: you want to shoot a photo of something in a hurry, and it’s not straight. Back in the days of film, you’d get your prints back from developing and look at them, and if you wanted them straightened out, you’d have to use scissors. Fortunately, it’s a simple process now. 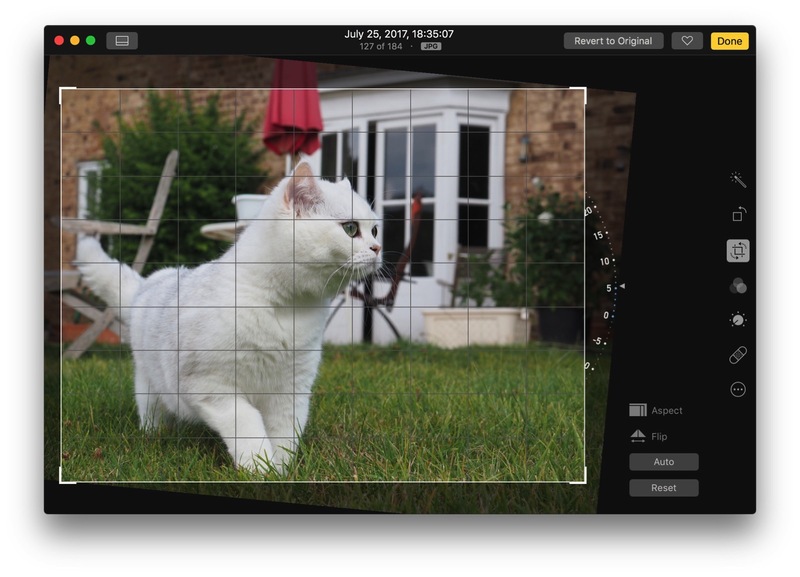 In Apple’s Photos app, you can do this in a few clicks. First, go into Edit mode. To do this, select a photo and press Return. In these screenshots, I’m in Edit mode; you can tell that you’re in this mode because of the black background and the buttons on the right side of the window. To straighten a photo, you use the Crop tool. In the next screenshot, you’ll see I’ve select that tool in the column of buttons at the right. When the crop tool is active, you’ll see a frame around the image, and, to its right, a small arc showing numbers like on a clock. If you click anywhere on that arc, you can drop up or down to rotate the image. It moves as you drag, and Photos also displays grid lines to help you align the image. As you can see above, I’ve aligned the edge of the lawn with one of the grid lines. Photos maintains the aspect ratio – the white frame – and zooms the photo so after cropping it fills the frame (you can see what’s being cropped outside the frame). Note that you can also do this on an iPhone or iPad; tap the Edit button, and you’ll see the Crop button. It works the same on iOS as on the Mac.